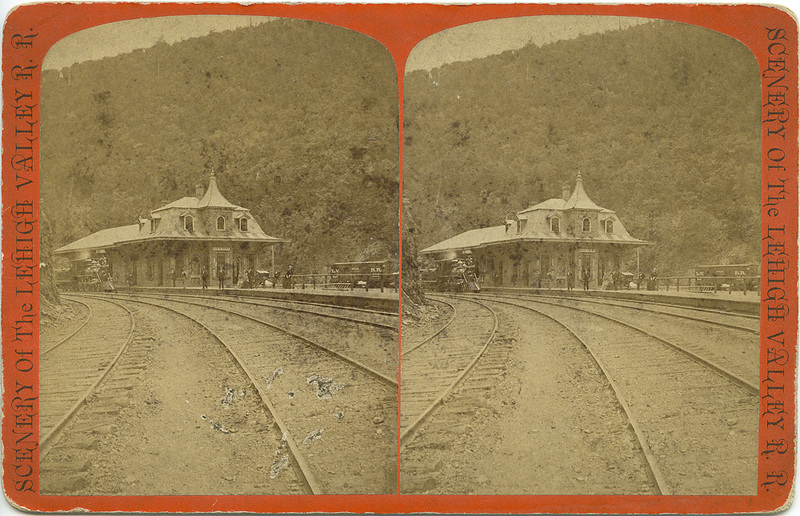 After digging up the stereoview of the Lehigh Valley Railroad station, I did a quick peek on Ebay to see if I could find any others. Whaddya know, my first search turns up another in the series. It’s in pretty rough condition, but I bought it anyway because it was going cheap. This is one case of a stereoview set that I’ll actually try to complete – there’s only 24 in the set. I have a casual interest in railroad memorabilia, as my grandfather was a conductor on the Pennsylvania Railroad’s Broadway Limited between Altoona an Chicago in the first half of the 20th century. I’m also a roller-coaster fan, so finding a photograph of the first roller-coaster is pretty cool (first roller-coaster you say? see the blurb below). 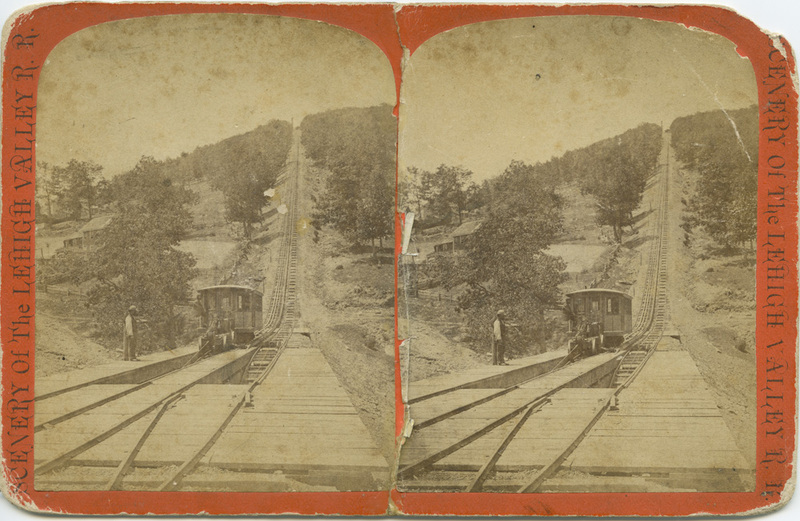 This is a picture of the switch-back gravity railroad, which was originally built to aid in bringing coal from the top of the mountain to the railroad. It quickly grew into a tourist attraction, and then became the first roller-coaster in the United States, when it became dedicated to passenger service. The car would be towed to the top of the mountain on one track, then switch and fall down the other track propelled by gravity alone. There was a driver/brakeman in the car to prevent it from flying off at the bottom out of control. The town is Mauch Chunk, Pennsylvania, now known as Jim Thorpe, PA, named to honor the Native American athlete. Ironically enough, Jim Thorpe was from Oklahoma, and his sole connection to Mauch Chunk is that he attended the Carlisle Indian Industrial School in Carlisle, Pennsylvania, and that Mauch Chunk was a Native American name approximately meaning “Bear Mountain”, because the mountain in whose shadow the town was built looks like the back of a bear. After he died in 1953, his surviving wife sold his remains to the town, which hoped that his grave would be a tourist attraction. This next image is another recent acquisition – another Washington DC carte-de-visite. This one, if the inscription on the back is accurate, is a self-portrait by the photographer, or at least the inscription is by the photographer – “Your Friend – From Mr. Arthur(sp?) Woodley”. I’m curious if the Woodly on the card is a typographical mistake, as the signature really does look like it says “Woodley”. 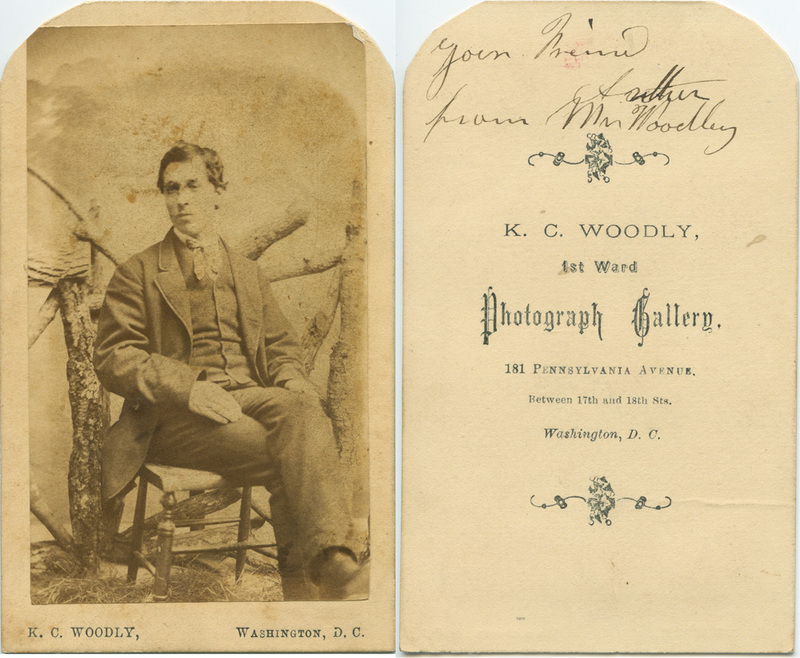 I’m also curious if the Woodley/Woodly is any relation to the Woodleys for whom Woodley Park was named. Given how small a town DC was in the 1860s, I’d say the odds are in favor. The address on this one is a mystery – 181 Pennsylvania Avenue would put the studio on the Capitol lawn. Furthermore, he indicates that the studio is located between 17th and 18th Streets, which would make 1781 Pennsylvania Avenue a more likely actual address. I wonder if the printer was short on E’s and 7s when he ran these off. I was doing some clean-up in my office the other day and ran across these two images. Absolutely nothing to do with each other. I don’t remember where I found the doctor’s office photo, but I got the Lehigh Valley Railroad stereoview (I know, here I go again with the stereoviews I “don’t collect”) in Sacramento, California, and I suspect that’s a large part of the reason I got it – curiosity as to why something so regionally specific ended up on the opposite side of the country. The doctors’ office photo I bought because my father is a (now retired) physician, and it was interesting to see what a doctors’ office at the beginning of the 20th century looked like. I love the pillow on the sofa that says “Here’s to the world, for fear that someone may take offense” – proof that cheesy knicknacks are not a late 20th century phenomenon. 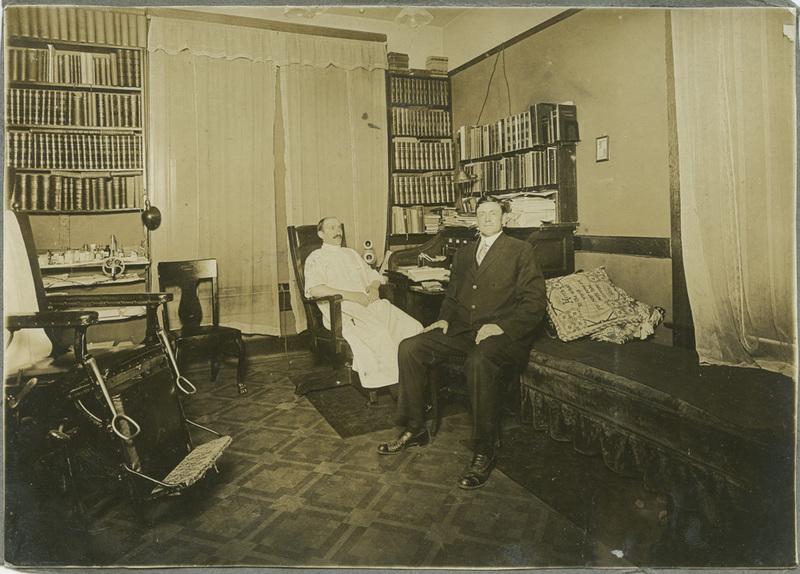 The stirrups on the chair make me wonder if it is a gynecologist’s office, and the relationship of the subjects of the photo is odd – the doctor seemingly asleep in the chair, and the man in the suit facing the camera – is he a patient, a friend of the doctor, the photographer, or a combination of the above? Stereoviews are not something I routinely collect, because there’s gazillions of them out there (I know, gazillion is such a technical term) and they’re already by themselves a hot collectible. I couldn’t resist this one though because I see pretty much the same view from my office’s conference room window every day. 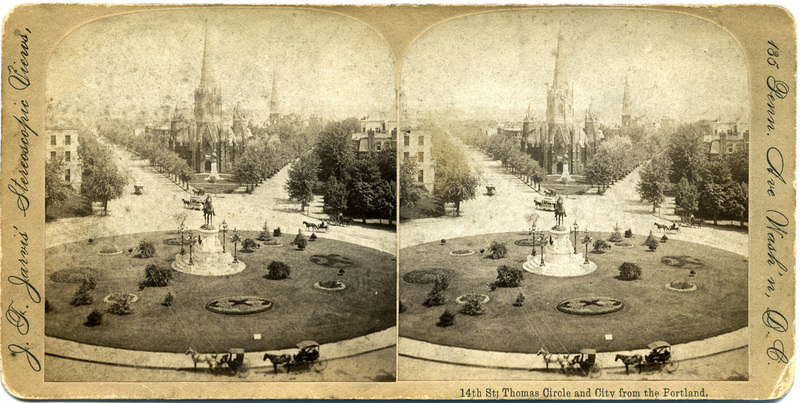 The Lutheran church with the statue in front hasn’t changed, but on the left is now the National City Christian Church, and on the right, the trees are gone and replaced by the Washington Plaza hotel. The landscaping in the circle is completely different, as is the traffic pattern around the circle. I think the land area of the circle island is much smaller, to accommodate additional traffic lanes. I have done a bit of digital restoration on this scan because the original stereoview has seen better days.